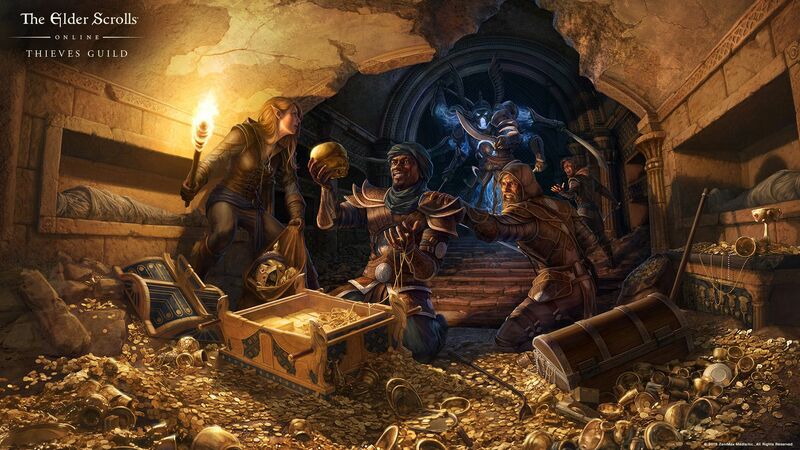 Becoming a master thief in ESO is, in my opinion, the best way to earn money if you are not really the type of player that will consume time in guild trading to earn some coins. Even though trading can sometimes be more profitable, it takes some hell of a boring time in comparing prices and finding the proper traders for the right items. Stealing is the easy way of making money, and in my opinion at least, is actually pretty fun as well. Though being a master thief is demanding on skill points and gets some time to get used to the techniques. Thieves Guild DLC – Worth It? Well if you ask me, it does! Not only for the passive skills that give you, I would say that this is the least actually. The quests of Thieves Guild, as well as the dailies the guild provides, is the main reason of a thief considering buying the Thieves Guild DLC. The quests were literally awesome, really funny and really intriguing. 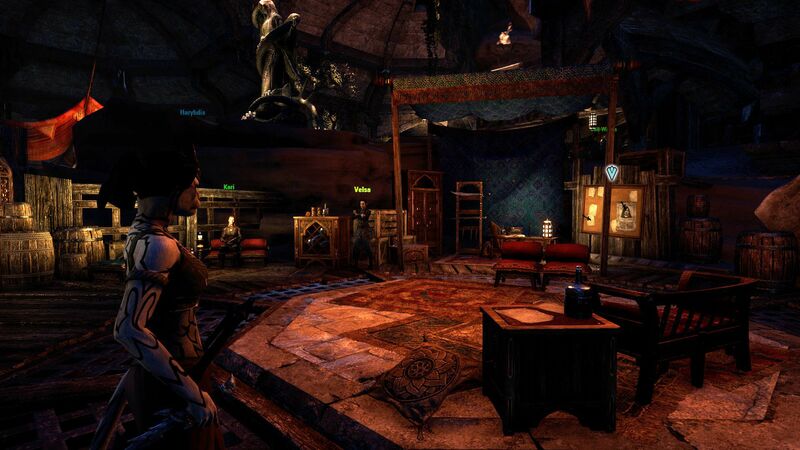 Zeira, Quen and the resto of Thieves Guild team, will get you through trespassing areas to help the members through various “illegal activities”. They will reward you with skill points and helpful gear for stealing. Thieves Guild also provides 3 dailies, and one of them is repeatable. 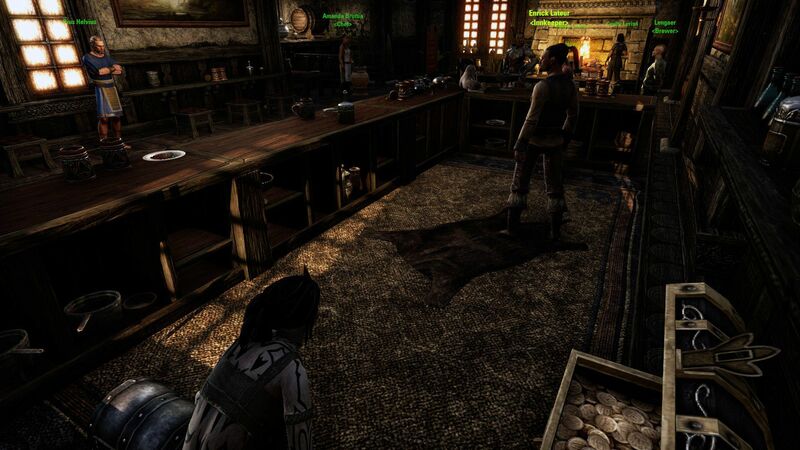 They all located in the town of Thieves, Hew’s Bane, and more specifically in the Thieves Den. Kari is located in Thieves Den at Abah’s Landing, and she will send you to areas around Tamriel to pickpocket or break into safeboxes. When you complete the quest on the first area, Kari will ask you to go to another area and continue. If you complete all three areas in once and get back to Kari in Thieves Den, she will reward you with a large stolen shipment and a Counterfeit Pardon Edict, which is clearing a bounty up to 500 coins. If you complete one area and get back to Kari, she will just pay you the cash and the shipment without the Counterfeit Pardon Edict, but you can earn more money by going back after every area you complete, so you just do as you please. Note that Kari won’t take what you’ve stolen for the quest, so you can still sell them. Fa’ren-Dar’s and his Heist Board are located inside the Thieves Den and he is gonna give you a great way to practice on staying hidden, avoiding guards and overseers, and opening locked chests, while his rewards are totally worth it. You have 7 minutes to find some hidden caches and a treasure. You teleport to the heist, right after you accept the quest. The time starts exactly when you enter the heist. You will have to avoid traps that stun you and suspend your stealth. If someone sees you, you will lose time on the counter. 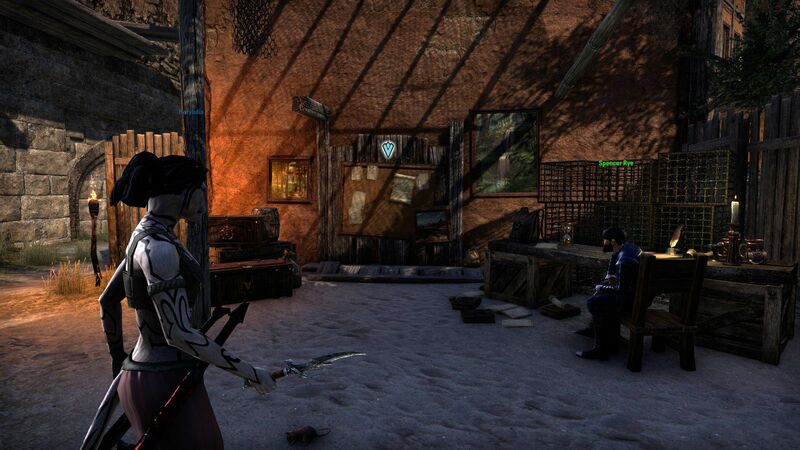 If you get out of the heist before the time ends you will receive a large stolen shipment, cash and an armor or a motif for Thieves Guild crafting style. But if you get out after the time ends you just get a stolen shipment and some money, so completing the heist with the challenges as well, should be your clear goal on this. The second daily will be given by Spencer Rye, who is located outside the Thieves Den as well. Spencer will ask you to visit local delves and world bosses to get him some items he needs. Note that you don’t need to complete the delves or eliminate the bosses, he just needs some items that are in these areas, he just may casually ask you to kill some NPC’s or rescue some of them. The reward will be just some money. To be honest with you, I don’t do that daily often. Stealing is still more profitable. 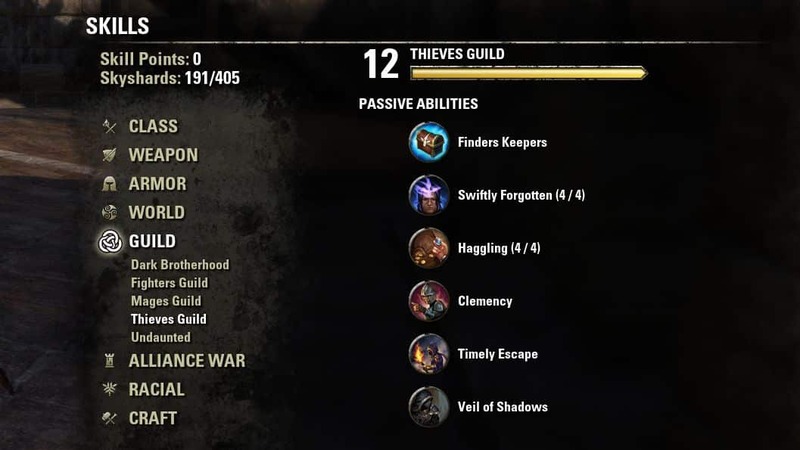 Thieves Guild Skill Line contains only passive skills contain some “must-have” skills to make you less noticeable and reduce your detection range. But on the other hand, some skills to get you through your “unlucky times” of stealing. 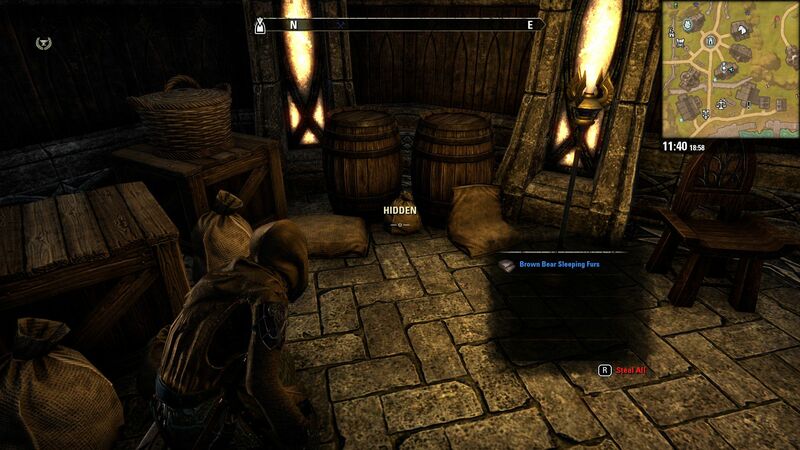 Finders Keepers: Thieves Troves are small caches, with a light purple-blue glow around them, located all around Tamriel. 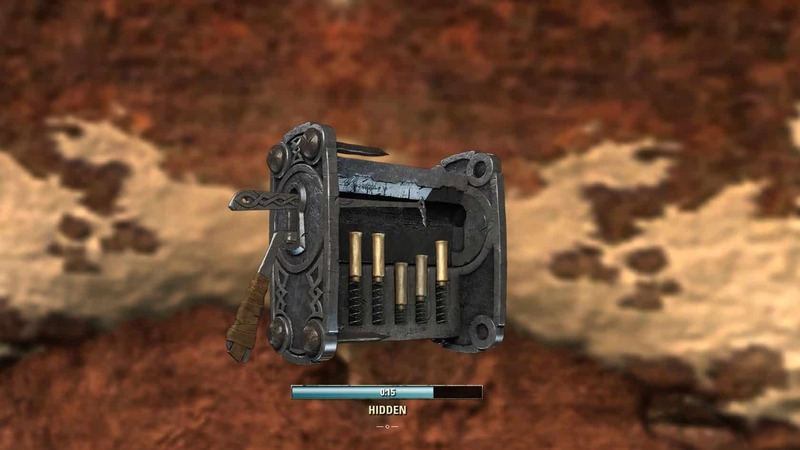 They usually contain lockpicks, some coins and either equipment, treasure maps, or stolen shipments. Tip: Don’t forget to crouch and stay hidden while you picking up a Thieves Trove and while opening the stolen shipments, it’s still considering stealing. Swiftly Forgotten: Swiftly Forgotten decreases your bounty and heat after three seconds, which is the “must-have-first” of all the skill line. In its full glory, the skill can decrease bounty to 115 and heat to 64 every three minutes. While not having this skill waiting for even the lower bounty to decrease, takes just forever. Haggling: With this passive, your haggling skills grant you the ability to get up to 10% more for stolen items you sell to any fence, but it does not apply to laundering. Clemency: When used, a guard that was going to arrest you will have a turn of heart and won’t take your money and stolen goods. Also, guards will not attempt to accost you for one minute after you use Clemency unless you commit other crimes. Clemency is usable once a day, so use it wisely! Timely Escape: With Timely Escape, there is a chance a “Footpad” may appear in any town with an Outlaws Refuge when you have heat and are in combat. Interacting with the Footpad will whisk you away to the safety of the nearest Outlaws Refuge. Veil of Shadows: With Veil of Shadows, witnesses and guards have their detection range decreased by 10%. With decreased detection range, witnesses are less likely to notice crimes and guards won’t challenge you until they get closer. In conclusion, Thieves Guild totally worth it. Most of the passive skills it offers, are all the help you could get on stealing. Selling stolen items on higher prices, having that bounty that never falls, disappearing before catching your breath and of course the reduction of detection range, are the top 3 skills that will help you master stealing. Daily quests of Thieves Guild are another good reason that the DLC worth it. 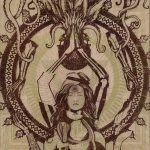 Rewards like rare crafting motifs of Outlaws, large stolen shipments, the known as Counterfeit Pardon Edict, that reduces bounty, cash of course, and many more. Daily quests are also a good training for the ones that are new to the Outlaw’s way of living. Legerdemain Skill Line opens the very first time you steal an item, by pickpocketing an NPC. 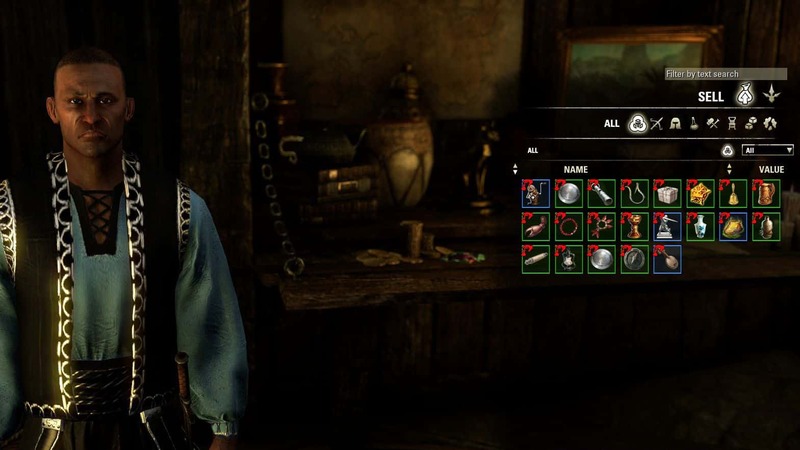 In a nutshell, it contains all you could ask to feel safer while stealing, as better chances to pickpocket, increased the chance of forcing locks and many more! You can earn levels fast by fencing all the good items you find until you reach your limit in the fence. 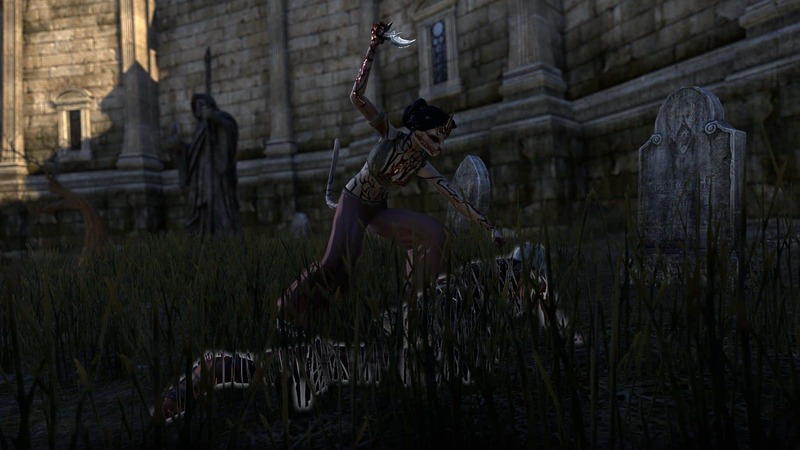 Improved Hiding: This skill is no more than its name says, so it reduces stamina cost of sneaking up to 40%, which is not important only for stealing activities, but even for assassinations and why not for various circumstances in Cyrodiil! Light Fingers: This is skill, is, in my opinion, the first one you will have to give all you got since the beginning of your career as a thief. This skill can improve your chance of pickpocketing up to 50%, so the guards will never, ever, be a problem again! Trafficker: This is a skill that will help you sell up to 160% more items on the fence. 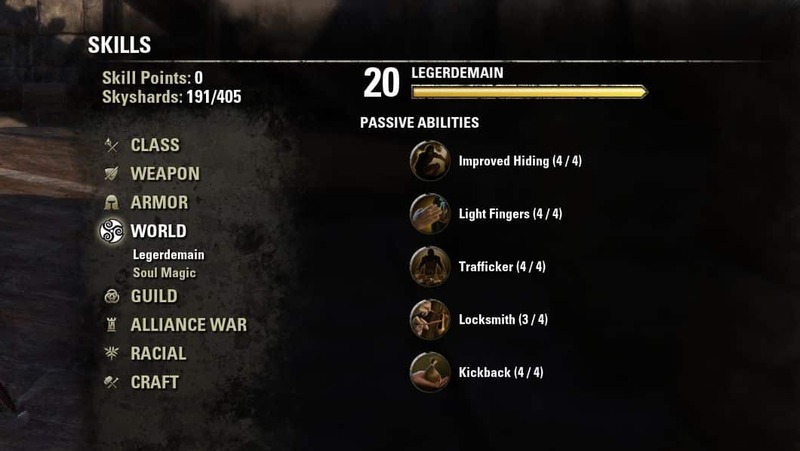 If you give skill points on this passive skills on early-game, and you sell on your limit high-priced treasures, your Legerdemain will reach its cap in no-time! Locksmith: This skill helps you forcing locks open, up to a chance of 70%. Really useful in Banks and Guilds, that are usually kinda busy with NPC’s and Guards, and of course, works for any lock in the game! Kickback: In cases that you spent your right to clemency, and a guard stops you to pay him the bounty that is upon your head, this skill can help you to reduce the bounty you pay to Guards, and Fences as well, up to 40%. Still, it’s better to pay on Fence if you have stolen items on you. The fence will not take the stolen goods from you, but a Guard will. 1. Spend Your Skill Points Wisely. 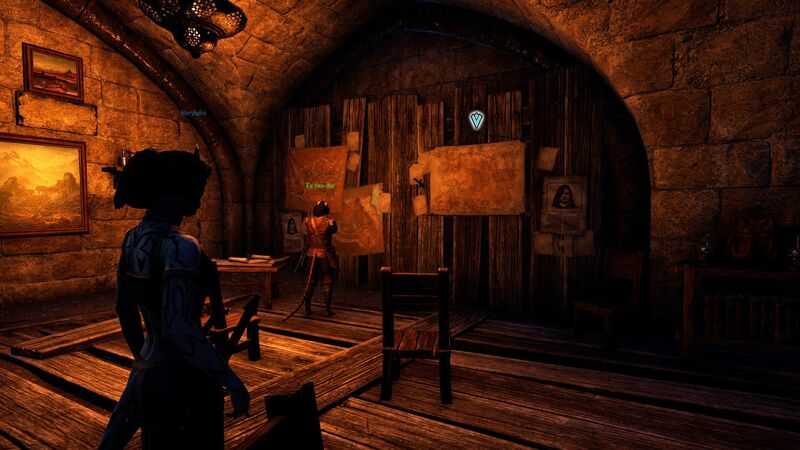 The first step is to boost the right skills on Legerdemain & Thieves Guild Skill Lines. On Thieves Guild Skill Line you gain experience by committing crimes on the guild job board, completing heists, and aiding your guildmates. As for the Legerdemain Skill Line, the most effective way is fencing expensive treasures. The reason I didn’t include the “Timely Escape” skill, is that Footpad is rare to appear, and if you are inside a building, the Footpad appears outside, and guess what, in combat, you cant open any doors! In my opinion, eating a good vegetable dish that increases your stamina, drinking a stamina potion, and run the hell away from the NPC that chases you, is your best option against the Footpad. 2. Take Your Time To Figure Out The Movement Patterns Of The NPC’s. When you are sneaking to open a safebox, first take a look around, and make sure no one is coming towards you. First, figure out the moving pattern and then open the safebox. Same rules apply to pickpocketing, and all the other stealing activities. 3. Pick The Best Areas For Breaking Into Safeboxes, And Make Daily Runs There. If you want to be a Master Thief, I will guess that the main reason for anyone to want to be one, is the sweet money you can earn by these tempting, but illegal activities. So for you to reach the desired amount of money you need in-game, you will have to make some routes, in different cities around Tamriel, that have enough points of interest with safeboxes. You usually can find some in Guilds, homes, merchant stores and banks. Banks always have safeboxes of Master difficulty, that they hide good treasures mostly, you may be unlucky sometimes, but it’s worth trying. Combine the breaking into safeboxes with pickpocketing for better results. 4. Being in Dark Brotherhood Helps A Lot To Make You A Master Thief. The obvious reason is that even if you max your pickpocketing skills, sometimes a “living victim” under an 80% chance of a successful pickpocketing, starts to get just a little bit risky. So if you can hide really well, you can just use Blade of Woe, and pick your treasure from the “now-dead-victim” and keep going with your next goal. 5. Only Fence Green, Blue & Purple Treasures. Simple Ones Don’t Worth It. The most usual treasures you will find are the simple “white” ones, that cost 40 coins, and they don’t really worth selling, or even laundering. Reaching your fence limit by selling these treasures is not profitable at all. Just let them be and keep looking for the good ones! 6. Talking To An NPC Will Make Him Change Location Faster. If an NPC insists on staying over a safebox that you wanna break into, if you talk to him will make him change position faster. Like you are reminding him to go somewhere! 7. Don’t Ignore Barrels, Sacks & Crates When Stealing. When you are out on your route, for a good stealing run, don’t ignore barrels sacks and crates. When containers like those, are on other’s property, there is a really good chance that they contain a treasure, and sometimes, a pretty good one! Worked in nightclubs and music events for years. Finally enjoying gaming by exploring anything fun to play. Mostly FPS lover and believes in the emo revival. What is that style of skin the Khajiit on the banner has? I love it and I really want it. Great article BTW, I think I am going to start a NB Dark Botherhood/Thief character. Thank’s for the nice feedback, the article will be updated soon! and the Body Marking Dragon Vassal. You can claim it on the Scalecaller Crown Crate! I have an idea for a character. I want to replicate an Undead Rogue from WoW into ESO as a Stam NB. I think those markings would work well. Cant wait to see the updated article!